Preheat the oven to 350 degrees F. In a large bowl, sift together the flour, baking soda, and cream of tartar (if using). Set aside. Using an electric stand mixer fitted with the paddle attachment, beat the butter, granulated white sugar, and light brown sugar on medium-high speed until fluffy, about 2 minutes. Then add the egg, oil, and white vinegar (if using) and beat on medium speed until well combined. Scrape down the sides of the bowl using a rubber spatula as needed. Then add the Rice Krispies cereal, oats, coconut, and toffee bits and stir on the lowest speed just until combined. On the lowest speed, stir in the flour in 2 or 3 separate additions until well combined. Very gently, scoop out a tablespoon of cookie dough (heaping if you prefer larger cookies) and use your finger tips to gently shape it into the rough shape of a ball. Try to keep the dough airy and don’t compress it when shaping it into a ball. Place the ball of dough onto a parchment paper-lined baking sheet. Repeat this with the remaining dough, placing balls of dough about 1 inch apart from each other. Bake the cookies in a preheated oven until the edges and bottoms are a nice and light orange brown colour, about 12 minutes. 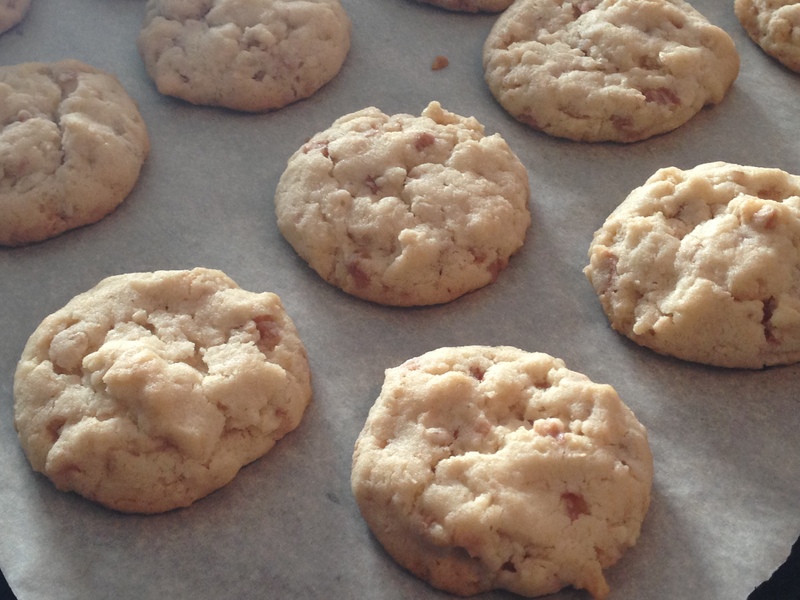 Bake for an extra minute if you want your cookies to be crunchier and harder in texture. Remove them from the oven and allow them to stay on the baking sheet for 3 to 5 more minutes. This will allow the cookies to depuff (i.e. flatten), crisp up more, and firm up for transferring to a cooling rack. Allow them to finish cooling on a cooling rack. Enjoy them warm or at room temperature. These cookies taste best on the day they’re made. Note that although still delicious, the texture gets crunchier and drier after the first day. They can be stored in an airtight container at room temperature or they can be frozen. Simply defrost at room temperature before serving.